VPN Tracker is the market leading VPN client for Mac OS X. The brand new VPN Tracker 7 is developed for professional use by consultants and businesses. VPN Tracker uses the industry standard IPsec protocol and is universally applicable. It supports standard and vendor-specific methods for automatic configuration and authentication. VPN Tracker includes device profiles for more than 300 VPN gateways of the leading manufacturers. The new Network Scanner in VPN Tracker 7 gives you a complete overview of all devices in your network. While scanning, VPN Tracker recognizes the type of device or the operating system it is running, and displays available services for direct access. 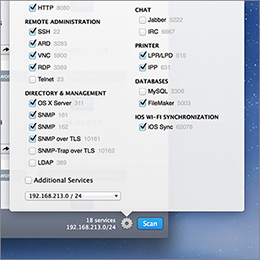 VPN Tracker's Network Scanner automatically scans for the most frequently used network services. You can customize the services that are being scanned for: file shares, remote administration, screen sharing, databases, web and mail servers, etc. With just one click of a button, the Network Scanner in VPN Tracker 7 connects you to your device or network service. Need a host's IP adddress elsewhere? No problem, simply copy and paste it. The Network Scanner automatically recognizes differend kinds of devices and operating systems, and groups devices and services accordingly. Display scan results by IP address, host name and operating system, or sort according to services. Filtering and website previews give you an instant overview of your remote network. VPN Tracker 7 pays off quickly for Apple consultants. The integrated Accounting function takes care of time-tacking, so the end-of-month burden of adding up consulting time is eliminated. VPN Tracker 7 Pro records all connections with date, IP address, traffic, and connection duration. Enter comments to track your work for later reference – whether it's billing or finding out just when you last updated that server. Export to Numbers, Excel, or to billing systems using customizable CSV export. Enter a reference number or organization in your connection to easily match accounting records with your billing system. And if you're billing in 15 min increments, VPN Tracker even takes care of rounding. VPN Tracker 7 Pro is great for power users and consultants. Be connected to multiple VPNs simultaneously and stay organized with search and improved groups, even with a large number of VPN connections and clients. Group your connections by project or client. In VPN Tracker 7, Secure Desktops can be put in any group, so you can now have everything in one place. And if you're ever lost, the built-in search quickly locates a particular connection or client. Your VPN's status is shown right in the menu bar, there's no need to have a window open to be in control. From the menu bar, you can connect and disconnect VPNs, and even use Secure Desktop items. And when you're done for the day, click End Session to disconnect servers, close applications, and then disconnect the VPN. Save space on your screen by hiding VPN Tracker's Dock icon and controlling VPN Tracker from the menu bar. And if you have a lot of connections, the new condensed layout in VPN Tracker Pro fits more connections on the same screen. VPN Tracker is universal. It is not bound to a single device, manufacturer or proprietary solution. To make it even easier to connect, VPN Tracker supports various standard and vendor-specific protocols for automatic configuration and authentication. VPN Tracker is built on the industry standard IPsec protocol. Thus it's compatible with almost every IPsec-based VPN gateway. And if you also need to use OS X L2TP or PPTP connections, you'll be able to control them all from one place with VPN Tracker Pro. If you're working with Cisco devices, configuration is a snap with VPN Tracker's support for Cisco EasyVPN connections. No need to worry about configuring IP addresses, remote networks and various other settings - VPN Tracker works with your Cisco VPN gateway behind the scenes to take care of this for you. Whether you are connecting to a NETGEAR, Juniper Networks or LANCOM VPN gateway, VPN Tracker can use Mode Config to automatically obtain IP addresses and DNS settings to take the hassle out of administrating multiple VPN users. Simple Client Provisioning will automatically detect your SonicWALL VPN gateway and give VPN Tracker what it needs to connect - all you need is to enter your SonicWALL's public IP address, or host name, and VPN Tracker does the rest. VPN Tracker works great with WatchGuard's easy-to-configure Mobile User VPN. IP addresses and DNS settings are automatically transmitted to VPN Tracker making the rollout of VPN connections a breeze. VPN Tracker supports Hybrid Mode Authentication - not just for CheckPoint. This is a definite advantage for many users, in particular with Checkpoint or any other VPN gateway that supports Hybrid Mode Authentication. VPN Tracker is built with the security of your network in mind. We have integrated the latest security standards to make VPN Tracker secure and ready for the future – no matter what edition of VPN Tracker you're using. Security is the top priority for VPN Tracker and it uses everything OS X has to offer in terms of security: Your passwords are stored securely in keychain, and VPN Tracker takes advantage of the latest innovations in OS X security – code signing, 64 bit, XPC services, and more – to safeguard your data. VPN Tracker supports encryption up to AES-256 to satisfy even the most demanding requirements by military organizations, enterprises and government. And because encryption is only as strong as the weakest link, VPN Tracker's hash algorithms include SHA-2, and keys are negotiated with Diffie-Hellman (DH) Groups up to group 14 (8192 bit). If you need more security than passwords can provide, VPN Tracker also offers support for authentication based on X.509 certificates, smart cards, and PKI token. One-time passcode tokens, such as RSA SecurID, work great with VPN Tracker through Extended Authentication (XAUTH). Whether you are at an airport or using the hotel's WiFi, VPN Tracker has built-in intelligence to get you connected wherever you are. VPN Tracker automatically tests your Internet connection to determine whether to access your VPN using IPsec Passthrough or NAT-Traversal. Once tested, VPN Tracker will automatically use the most suitable method for all future VPN connections from this location. VPN Tracker supports VPN gateways that perform Dead Peer Detection (DPD) to detect unresponsive VPN clients and gateways. VPN Tracker's rekeying abilities enable it to reliably re-negotiate encryption keys. It automatically renews DHCP leases over VPN, to let you stay connected as long as you want. Use the 'End Session' button to automatically quit applications, disconnect servers and close databases before the VPN is disconnected. When disconnecting VPNs, VPN Tracker automatically disconnects from file servers and helps to prevent error messages or data loss. VPN Tracker provides access to all your VPN connections and everything else you need in one central location. Use this customizable interface to improve productivity for yourself and the VPN Tracker users you support. VPN Tracker's Secure Desktop makes it easy to organize your daily remote tasks: Just add the applications, file servers and other data that's needed for everyday tasks and workflows. In addition to standard items such as applications, servers and websites, Secure Desktop can be fully customized with AppleScripts and Automator workflows. Use Secure Desktop to make even the most complex tasks simple for your users. Secure Desktop helps you focus on the tasks at hand so you get your work done. It is no longer necessary to remember to connect your VPN before using an application or accessing a server - simply configure your Secure Desktop and VPN Tracker takes care of the rest. Every client and project is different - create multiple Secure Desktops and manage each individually. You can easily have everything neatly organized and cease to worry about users connecting and disconnecting to VPNs. Secure Desktop not only streamlines your workflow, but can also become part of your corporate identity: simply customize your Secure Desktop with your company logo or corporate design. VPN Tracker is a universal security solution, making it possible to integrate virtual machines and remote desktop applications into your Secure Desktop, including Parallels, VMWare, Apple Remote Desktop, Microsoft Remote Desktop Connection, VNC and CoRD. VPN Tracker 7 is easy to deploy within businesses or to customers. Export connections and Secure Desktops from VPN Tracker Pro, and manage licenses using a well thought out, web-based system. It's quick and easy to distribute VPN Tracker 7 workstations. We've totally revised the license management and tailored to professionals use in businesses and large organizations. VPN Tracker ships as a standard OS X installer package, making it easy to integrate with 3rd party deployment solutions. 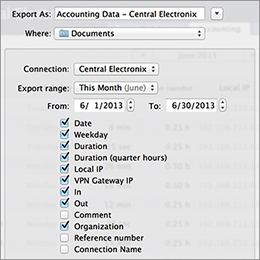 VPN Tracker remembers your VPN connection's export settings including your pre-configured Secure Desktops. The next time you export, you don't have to configure anything. This speeds up large-scale deployments and makes configuration changes as fast as the click of a button. If you need to connect to remote Windows PCs, Secure Desktop in VPN Tracker supports both Microsoft Remote Desktop Connection and CoRD so you don't have to leave VPN Tracker to share a screen with a Windows PC. Put your most commonly used Windows applications from Windows virtual machines on your Secure Desktop – right alongside your favorite Mac apps. Now you can have all apps right where you need them. As the market-leading VPN solution for Mac OS X, VPN Tracker is constantly one step ahead. VPN Tracker is a full 64-bit application and is ready for the Internet of tomorrow with support for IPv6. VPN Tracker fully incorporates the latest Internet Protocol standard - IPv6. Using VPN Tracker, you are already prepared for the next generation Internet today. VPN Tracker runs best with the latest OS X. VPN Tracker 7 will also support the upcoming OS X Mavericks when it is publicly released. You can also run VPN Tracker with older OS X systems, for details can be found in the System Requirements. Easily scan for devices and available servers on remote networks. With VPN Tracker 7 Pro, you can find and securely connect to specific devices using the right tools for the job. Accounting in VPN Tracker 7 Pro automatically tracks and protocols all of your VPN connections. Export to your time tracking or billing system, and you'll see how quickly it pays off. After all, time is money. With VPN Tracker Pro 7, you can manage even large numbers of VPN connections. Search for VPNs in your connection list, group and arrange your connections and Secure Desktops. Distribute VPN Tracker in your business with the new license management tools. The Network Scanner, Secure Desktop, and Status View, enhance the productivity of your mobile workers. VPN Tracker supports multiple vendors and includes device profiles for more than 300 VPN gateways. VPN Tracker 7 Pro pays off quickly for consultants: thanks to transparent Accounting, keeping track, exporting and billing your working hours is easier than ever. Even large numbers of connections are easily organized with VPN Tracker. The Secure Desktop is your control center with scripts, tools, and quick-connect shortcuts. VPN Tracker automatically checks if secure connections are possible, chooses the appropriate methods, and stores the setup. This is just one example of the intelligence and years of VPN experience built-in to VPN Tracker. You can use VPN Tracker 7 and 6 to protect remote connections with all Macs. Do you connect to your business network from on-the-go? Whether from the hotel WLAN, an Internet cafe, or a random hotspot, with VPN Tracker, you'll protect traffic between your Mac and your company network. We'll show you how. What does your IT environment look like? Not all Macs run the same OS X version. Covering all versions from OS X 10.4 all the way to the upcoming OS X 10.9 Mavericks, VPN Tracker is your number one choice. Which OS X versions are installed on your Macs? How many administrators should be responsible for setting up and managing connections? When are you planning on switching to OS X 10.9? Macs running OS X 10.7 and newer benefit from the new VPN Tracker 7. We’ll soon be offering a free update for VPN Tracker 7 for OS X 10.9 Mavericks. Running OS X 10.6 and earlier? Choose VPN Tracker 6 for full compatibility and security. Provide connections to your VPN Tracker 6 users right from VPN Tracker 7 Pro by choosing "VPN Tracker 6" as the export format. Compare VPN Tracker 7 to VPN Tracker 7 Pro. Now you can choose the right package to suit your business. Choose from three enterprise packs to match your business size. Allow your Mac-equipped business extremely secure access to internal resources such as mail servers, intranet and networks. Note: With the optional Protection Plan, you can transfer your current VPN Tracker to every future upgrade at no extra cost. The VPN Tracker Protection Plan runs 36 months, with the possibility to renew at any time. Keep your VPN Tracker up to date with the equinux Protection Plan. For the duration of your subscription you will have preferential and instant access to all upgrades, updates and patches for no additional charge. Annual upgrade fees are now a thing of the past. Service and support from the makers of VPN Tracker Get top-level support from those who know best about VPN Tracker. Quality telephone, email, or chat support, availabe for a duration of 36 months. Save money on upgrades Paid upgrades are now a thing of the past. As a subscriber to the equinux Protection Plan, you'll receive all upgrades and updates at no charge for the duration of 36 months, so you can reap the benefits of updates and improvements - automatically. Drop your total cost of ownership (TCO) by up to 66% The Protection Plan will save you up to 66% compared to the regular cost of yearly VPN Tracker Upgrades. Get your Protection Plan when you make your full version purchase, and you can extend your Protection Plan at any time while your subscription is active. Priority pass included Opt for the VPN Tracker Protection Plan and be given perferred accsess to the VPN Tracker Beta-Program. The VPN Tracker Protection Plan: your all-inclusive priority pass!